Can we say we know? When viewed within this context, new light is shed upon Mexican-American reformist activism in the twentieth century. Perhaps the best example of this political mobilization is the League of United Latin American Citizens (LULAC). Founded in 1929 in Corpus Christi, Texas, LULAC's central concern was to empower Mexican Americans through assimilation. It stressed the notion that Mexican Americans were U.S. citizens and therefore should have all the rights of Americans. Thus, LULAC "pledged to promote and develop among [themselves] what they called the 'best and purest' form of Americanism. "8 Yet, in so doing, LULAC members limited who they sought to empower; they imagined a community composed of American citizens of Mexican descent. Within the historical context of Mexican-American activism, the Chicano movement emerges as a moment—albeit an important one—rather than as a seminal event.11 Yet, like all epochs, the insurgency was a complex phenomenon with unique traits. With that in mind, this study seeks to assess the goals, achievements, and failures of the various political groups that encompassed the Chicano movement in Los Angeles—the city, then and now, with the largest concentration of ethnic Mexicans outside of Mexico City. Such an inquiry probes not only local protests, but also, necessarily, the insurgency as it emerged in communities elsewhere that naturally looked to Los Angeles for leadership. Los Angeles is also where I personally witnessed "those times of revolution." I am the son of Mexican immigrant parents who were born, raised, and married in Ciudad Juárez, Chihuahua, and who emigrated to Los Angeles in 1955. I was born in Boyle Heights, in East Los Angeles, and grew up in the adjacent City Terrace neighborhood, where I lived in a small two-bedroom house with my parents and four older brothers. My brother Carlos is twelve years my senior and began attending UCLA in 1968 when I was six. Though he was always Carlos at home, at school he was sometimes known as Chuck, but that changed when he got caught up in the burgeoning Chicano movement. Soon, he was no longer Chuck but Carlos. Our home was also transformed; prominently displayed on the walls of my brothers Arturo and Javier's room was a poster of a mustached man with his fist clenched in a power symbol and the words MI RAZA PRIMERO (My People First) scrawled on it . That was a great poster. In fact, my brother David, who was artistic and rebellious, liked it so much that he bought paints and poster board and created a colored version. A few years later, that poster was replaced with a large photograph of Cuban revolutionaries Fidel Castro and Ernesto "Ché" Guevara, with a caption that read "Somos Uno Porque América es Una" (We Are United Because America Is One Continent). The wall in my brothers' room reflected the change and continuity within the Chicano movement and also reflects the purpose of this study. 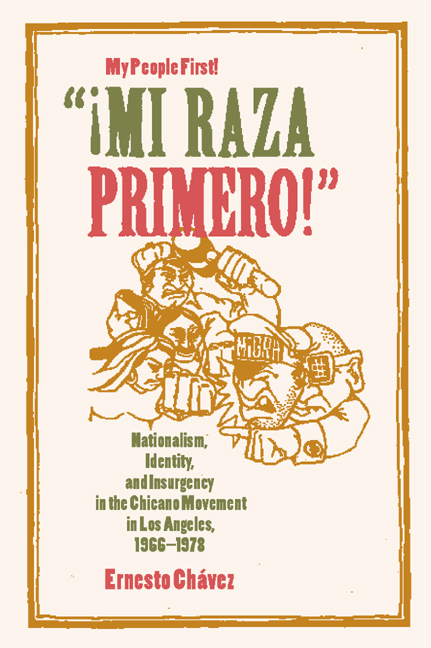 I argue that the Chicano movement embraced nationalist and Marxist-Leninist ideas that gained popularity as a result of the social, economic, and political conditions in which ethnic Mexicans lived. Those ideas were not static, however, for numerous individuals and organizations were constantly adopting and refining them—just as my brother David did when he painted his own version of the "Mi Raza Primero" poster. Although my brothers enthusiastically participated in the Chicano movement, I, considerably their junior, remained in the background and away from the fray (because my mother feared for my safety). Nonetheless, my memories as a distant observer initially guided my research, until the weight of the evidence I uncovered compelled judgments that frequently—but not always—are at variance with those of the movement's participants, including the scholars who chronicled their experiences. I see myself in the middle of two groups of people who have studied the Chicano movement—scholar-participants and those who have no personal connection or understanding of the insurgency. As a bridge between the two camps, this study has a perspective of its own on the "revolution" of the 1960s and 1970s. My inquiry is the first to examine the groups that encompassed the Chicano movement in one city. Unlike most previous work on the Chicano insurgency, my approach assumes that understanding the Chicano movement in Los Angeles requires comprehending the conditions in which the ethnic Mexican community lived and which shaped the identities of its residents. Those circumstances were not new, for they had prompted earlier protests, but in the 1960s and 1970s they roused the community as nothing had before, producing calls for change voiced in a common anti-American language of chicanismo that emphasized la raza (the people), huelga (strike), carnalismo (brotherhood), Chicano, and Aztlán—the latter a call for the re-creation of the Aztec homeland that some believed had existed in the Southwest.12 Beneath that common language, however, was great diversity in goals and strategies. Chicanismo was the vehicle used to express Chicano nationalism, which is best understood as a "protonationalism" because, as Eric Hobsbawm has argued, it is based on "the consciousness of belonging to or having belonged to a lasting political entity"—in this case, Mexico.13 Yet Chicano nationalism is more complicated because of the proximity of Mexico to the United States and the consequent reassertion of Mexican traditions through immigration.14 Thus, Mexico acts as a safety valve for the often-harsh realities of the United States, just as the prosperity of the United States serves as a safety valve for those immigrants seeking escape from Mexico's poverty. In the United States, Mexican protonationalism took the form of a "residual culture" that Mexican Americans used to combat what they found distasteful in the larger American society. A residual culture, according to literary critic Raymond Williams, consists of those "experiences, meanings and values, which cannot be verified or cannot be expressed in terms of the dominant culture, [yet] are nevertheless lived and practiced on the basis of the residue—cultural as well as social—of some previous social formation. 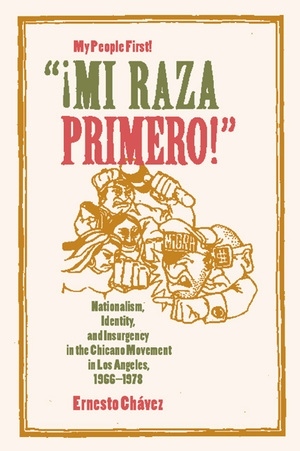 "15 Mexican nationalism became a Chicano nationalism created to confront the inequalities in American society during the Vietnam era.16 Thus, in the protest atmosphere of the 1960s, the residual culture, Mexican protonationalism, was transformed into Chicano nationalism, an "emergent culture," which, according to Williams, embraces the "new meanings and values, new practices, new significances and experiences, [which] are continually being created. "17 Ultimately, Chicano nationalism, though unique, can also be looked upon as a truly American phenomenon that at times encompasses the tenets of American liberalism. Chicano nationalism, as it emerged, privileged males and marginalized females. As Elleke Boehmer has observed about nationalism generally, the male role is usually "metonymic," that is, men are contiguous with each other and with the nation as a whole. Women, on the other hand, have only a "metaphoric or symbolic role. "18 Thus, carefully prescribed gender roles for both men and women characterized the Chicano movement and, as this study demonstrates, broaden our understanding of the insurgency's ideologies, tactics, and Chicano identity of the participants. The construction of Chicano identity is best understood, in the words of Stuart Hall, as a "process . . . that happens over time, that is never absolutely stable, that is subject to the play of history and difference. "19 Hence, my findings highlight the evolution of various Chicano identities within a fluid and constantly changing Chicano movement. This study begins with ethnic Mexicans of Los Angeles in the 1950s as they develop a community—that is, a Mexican protonationalism—to counter their sense of powerlessness resulting from limited political representation, police brutality, and urban renewal that displaced their communities. This is not to say that ethnic Mexicans lacked agency, but, rather, that the Cold War atmosphere circumscribed the reach and power of their actions. Throughout this era there is sporadic evidence of public displays of Mexican pride but not in the dramatic scale that one would see in the 1960s and 1970s. The relatively small number of ethnic Mexicans in the city meant that ties and imaginings of Mexico remained in the private rather than the public sphere. This situation changed in the 1960s as the ethnic Mexican population increased dramatically, which, within the protest atmosphere of the Vietnam War, allowed for the construction of a Chicano nationalism that fostered militant opposition to the inequalities of American society. The focus then shifts to four Chicano movement organizations—the Brown Berets, the Chicano Moratorium Committee, La Raza Unida Party, and the Centro de Acción Social Autónomo (CASA)—and how they imagined community and fashioned Chicano nationalism to fit their needs. For Brown Berets, the community groups most in need of help were the young street thugs, the vatos locos, who were being brutalized by the police. The Chicano Moratorium, on the other hand, viewed draft-age Chicanos as its core constituents. For La Raza Unida Party, the ballot box and Chicano voters were key to Chicano empowerment, whereas, for CASA, Mexican immigrant workers emerged as the crucial constituency. As opposed to other organizations, such as the Educational Issues Coordinating Committee (EICC), which was a multiethnic coalition, or El Movimiento Estudiantil Chicano de Aztlán (MEChA), which was not a single organization but rather had (and continues to have) chapters in various colleges and universities in the Southwest, or Cátolicos Por La Raza, a short-lived organization that was primarily concerned with democratizing the Catholic Church, the groups that comprise the bulk of this study best represent the trajectory of nationalism in Los Angeles's ethnic Mexican community. For the most part, these organizations were male dominated. That is not to say that women are not depicted in this study. This study's strategy has been to discuss gender, and its various manifestations and complexities, within the organizations covered. The Chicano movement, like the other social movements of the Vietnam era, had the potential of redefining the nature of what American society was—and is. The Vietnam era can be looked upon as a historic moment in which the United States failed to constitute itself as a truly democratic society. It is an example in which, as the political philosopher Ernesto Laclau has argued, the "distance between the universal and the particular [became] unbridgeable" and burdened activists with the "impossible task of making democratic interaction achievable. "21 My hope is that this study presents a conversation between the present and the past, and that it inscribes history with a resonant meaning. Perhaps in this way we can begin to understand what became of those days of revolution and truly forge a just society. This study rests on a wide range of sources, including interviews with participants, the papers of Chicano movement organizations, mainstream and movement newspapers, census reports, FBI reports obtained under the Freedom of Information Act, and ephemera like posters, pamphlets, and fliers. I have also consulted the works of previous scholars of the Chicano movement, who were, for the most part, participants in what they chronicled. Hence, their books and articles are not only frequently source materials, but they also have provided the scholarly foundation for subsequent research on this subject.22 I owe a huge debt to this body of previous work. My study is the first book-length attempt to grasp how the Chicano movement emerged in the community of Los Angeles. Others are invited to build upon this work so as to enhance our vision of the Chicano insurgency. Since this study deals with issues of identity, a few words on terminology are appropriate. For the most part, I have tried to identify the subjects of this study as they identified themselves. In the Chicano activists' vocabulary, the term Mexican-American meant someone who had assimilated—someone who had taken on an "American" outlook rather than a Mexican one. Chicanos also objected to being "hyphenated" Americans; they believed the term Mexican-American inferred that they were second-class citizens. The term Chicano, which to earlier generations was a label reserved for the "lower classes," denoted one's support of activism. In this study, only when Mexican American is used as a modifier does it contain a hyphen (e.g., Mexican-American generation). Yet, for clarity and variety, I go against the wishes of movement participants and use the terms Mexican American and Chicano interchangeably, to denote a resident or citizen of the United States. Those born in Mexico but who resided in the United States are called Mexican immigrants. When speaking of both Mexican Americans and Mexican immigrants, I use the phrase ethnic Mexicans. 1Frederic Jameson, "Periodizing the 60s," in The 60s Without Apology, ed. Sohnya Sayres, Anders Stephanson, Stanley Aronowitz, and Frederic Jameson (Minneapolis: University of Minnesota Press, 1984), 181. 2David G. Gutiérrez, Walls and Mirrors: Mexican Americans, Mexican Immigrants, and the Politics of Ethnicity (Berkeley: University of California Press, 1995), 38. 3I use the idea proposed by James R. Barret and David Roediger to describe the experience of Polish, Italians, and how other European immigrants became white. Though the experiences of Mexican Americans are different, they are also "in-between." See Barret and Roediger, "In-between People: Race, Nationality, and the 'New Immigrant' Working Class" (unpublished paper, 1997). 4For more on this, see Tomás Almaguer, Racial Fault Lines: The Historical Origins of White Supremacy in California (Berkeley: University of California Press, 1994). 5For more on this, see Neil Foley, The White Scourge: Mexicans, Blacks, and Poor Whites in Texas Cotton Culture (Berkeley: University of California Press, 1997); and David Montejano, Anglos and Mexicans in the Making of Texas, 1836-1986 (Austin: University of Texas Press, 1987). 6For New Mexico, see Deena J. González, Refusing the Favor: The Spanish-Mexican Women of Santa Fe (New York: Oxford University Press, 1999); also see Robert J. Rosenbaum, Mexicano Resistance in the Southwest: The Sacred Right of Self-Preservation (Austin: University of Texas Press, 1981). 7Neil Foley, "Becoming Hispanic: Mexican Americans and the Faustian Pact with Whiteness," in Reflexiones 1997: New Directions in Mexican American Studies, ed. Neil Foley (Austin: University of Texas-Center for Mexican American Studies, 1997), 66. 8Gutiérrez, Walls and Mirrors, 77. 9For more on the Congress of Spanish-Speaking Peoples and the Asociación Nacional Mexico Americana, see Mario T. García, Mexican Americans: Leadership, Ideology, and Identity, 1930-1960 (New Haven: Yale University Press, 1989). 10For more on the G.I. Forum, see Henry A.J. Ramos, The American G.I Forum: In Pursuit of the Dream (Houston: Arte Público Press, 1998). 11David G. Gutiérrez had argued this in "Significant for Whom? : Mexican Americans and the History of the American West," Western Historical Quarterly 24, no. 4 (November 1993): 527. 12Rafael Pérez-Torres, "Reframing Aztlán," Aztlán 22, no. 2 (fall 1997): 37. 13Eric J. Hobsbawm, "Popular Proto-Nationalism," in Nations and Nationalism Since 1780: Programme, Myth, and Reality (Cambridge: Cambridge University Press, 1990), 73. 14David G. Gutiérrez discusses this tension in Walls and Mirrors. 15Raymond Williams, "Base and Superstructure in Marxist Cultural Theory," in Problems in Materialism and Culture, 2d ed. (New York: Verso, 1997), 40. 16Literary critic Mikhail Bakhtin argues that a dialogic contact occurs when "the text" comes "into contact with another text (with context). Only at the point of this contact between texts does a light flash, illuminating both the posterior and anterior, joining a given text into a dialogue" (see Bahktin, Speech Genres and Other Late Essays [Austin: University of Texas Press, 1986]), 22. 17Williams, "Base and Superstructure," 40. 18Elleke Boehmer, as quoted in Anne McClintock, Imperial Leather: Race, Gender and Sexuality in the Colonial Contest (New York: Routledge, 1995), 355. 19Stuart Hall, "Ethnicity: Identity and Difference," Radical America 23, no. 4 (October-December 1989): 15. 20Van Gosse, Where the Boys Are: Cuba, Cold War America, and the Making of a New Left (New York: Verso, 1993), 8. 21Ernesto Laclau, Emancipation(s) (New York: Verso, 1996), 35. 22Among the books that have examined the Chicano movement are Ignacio García, Chicanismo: The Forging of a Militant Ethos Among Chicanos (Tucson: University of Arizona Press, 1997); Juan Gómez-Quiñones, Mexican Students por La Raza: The Chicano Student Movement in Southern California, 1967-1977 (Santa Barbara: Editorial La Causa, 1978); Carlos Muñoz, Youth, Identity, Power: The Chicano Movement (New York: Verso, 1989); Armando Navarro, Mexican American Youth Organization: Avant Garde of the Chicano Movement in Texas (Austin: University of Texas Press, 1995); Armando Navarro, The Cristal Experiment: A Chicano Struggle for Community Control (Madison: University of Wisconsin Press, 1999); and Ernesto Vigil, The Crusade for Justice: Chicano Militancy and the Government's War on Dissent (Madison: University of Wisconsin Press, 1999). ¡Mi Raza Primero! is the first book to examine the Chicano movement's development in one locale—in this case Los Angeles, home of the largest population of people of Mexican descent outside of Mexico City. Ernesto Chávez focuses on four organizations that constituted the heart of the movement: The Brown Berets, the Chicano Moratorium Committee, La Raza Unida Party, and the Centro de Acción Social Autónomo, commonly known as CASA. Chávez examines and chronicles the ideas and tactics of the insurgency's leaders and their followers who, while differing in their goals and tactics, nonetheless came together as Chicanos and reformers. Ernesto Chávez is Associate Professor of History at the University of Texas, El Paso. Introduction: "Those Times of Revolution"
Afterword: "Why Are We Not Marching Like in the ’70s?"